Bay Area Graphics & Marketing is a Florida Website Design Company Serving Customers throughout Tampa Bay and Florida Since 2001. Bay Area Graphics and Marketing offers small business owners web design services and solutions for any budget. We're focused on providing our clients with personalized, professional and reliable website design and SEO services. Our clients appreciate the added attention we provide in this "digital" and DIY world! 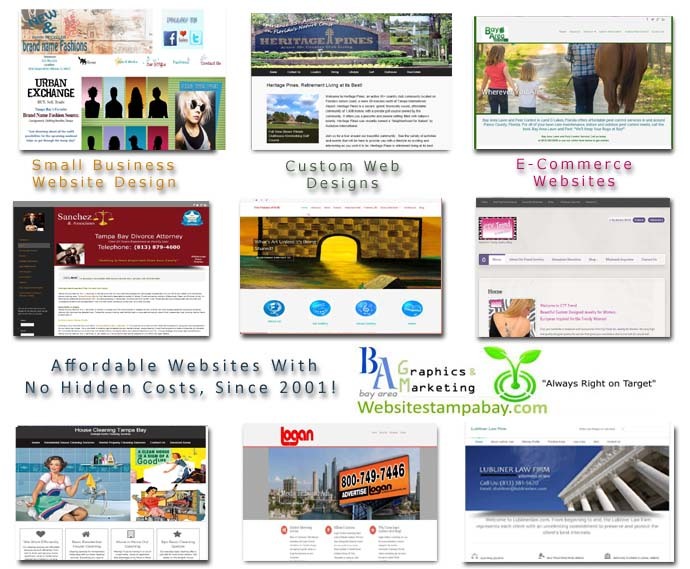 Our website design services for Tampa and Florida small businesses has been proven effective since 2001. See what a difference we can make in your budget, ranking and peace of mind! Click on the following links for detailed information, give us a call at 813-778-9548 or Email us for a rapid response. We offer the most affordable, effective SEO for Tampa small businesses. SEO does not have to be complex, yet many Florida SEO firms make it seem so. We include SEO services with basic web maintenance and WordPress maintenance services, plus include social media marketing that works. We are happy to spend time with you to answer any questions you have about our web design or SEO services. Reach out to us today and learn about our affordable SEO services and affordable web design services for Tampa and Florida business owners. Is There an End to Your Website Marketing?